Towering over the few frostbitten refugees who survived the flight from London to the promise of warmth, safety and survival against the cataclysmic climate change stands The Generator: Frostpunk’s defining centrepiece. The massive, mechanical monstrosity is all that stands between the last surviving civilisation and the extreme sub-zero temperatures which has plunged 1886 Earth into a deep and sudden Ice Age. Standing inert in a deep crater, surrounded by the debris of expeditions past, you heave a lever and — with a grinding, satisfyingly mechanical roar — the fires of life erupt from the bowels of the behemoth. The surge of burning coal engulfs the surrounding area with the rarest commodity in this new world: heat. Melting the snow and briefly holding back the ever-prevalent advancement of death, The Generator’s activation marks the beginning of your city’s long, deadly battle against the ever-threatening frost, starvation and social unravelling. Welcome to Frostpunk. 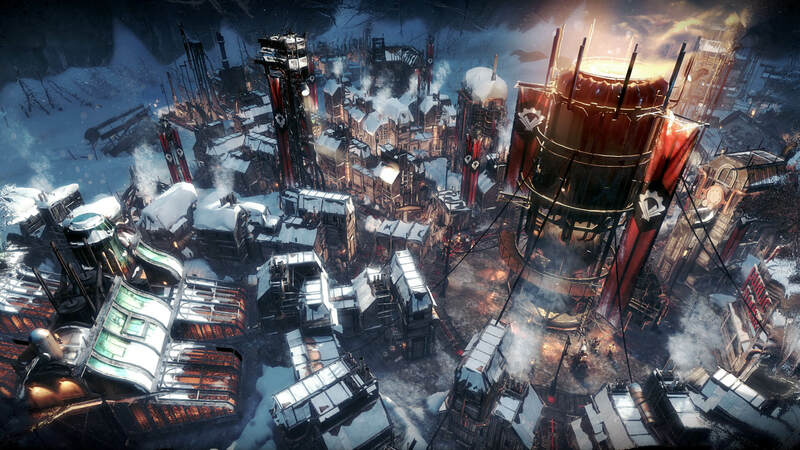 Forging its own sub-genre, Frostpunk is a “society survival” game in which you place buildings, manage resources and tend to the needs of your citizens. On top of this, you must also adapt and survive against the gradually falling temperatures. Research new heaters, replace your tents with houses and ensure you have an adequate food supply as to feed your city. Developers 11 bit Studios have put particular emphasis on the societal and moral mechanics of Frostpunk, with hope and discontent being two key metrics which can massively impact the game. You can periodically pass laws and make moral decisions which define the direction of your society. Do you allow child labour to ensure everyone is doing their part? Each choice impacts your hope and discontent meters; if the hope meter falls to zero or the discontent meter reaches max, you lose. This lends the game its sense of bleakness, that — whilst juggling the resource and material needs of your city — you must also balance the societal evolution. Those who have played the developer’s previous title This War Of Mine will see the moral-choice parallels, however, Frostpunk decisions are made for the long-term benefit. Those morally risky, sacrificial decisions which cost lives are for the literal survival of humanity. Banishing a few criminals to the frozen wastes or instructing armed guards to hand out propaganda leaflets to prevent hope from plummeting, and the last human society to crumble; these options are framed as pivotable moral choices which the game really wants you to consider and feel for, but ultimately just move the two bars up and down. They stop becoming qualifiable, grey choices and merely become quantifiable numbers. Once you reach the late game, these become practically meaningless as hope and discontent can be easily managed with a few daily building abilities across your city. This robs the game of the personal, uncomfortable moral choices that This War Of Mine captured so well due to its small scale; because you focus on the macro, individual people don’t matter. Morality aside, the game paints a breathtakingly beautiful scene of hopelessness and desperation, where heat means everything. Your city becomes a skyline of billowing fire, thick plumes of smoke and roofs of ice. Your citizens shuffle between their places of work and homes, bracing against the arctic winds whilst pushing their way through the fresh drifts of snow. As night descends on your crater, a column of lanterns weaves its way to the elevator built into the wall as hunters prepare for a night of gathering whatever fauna remains alive beyond. This is where the simulation aspect shines, each citizen goes about their day collecting coal, preparing food or healing the sick. The crudely heated streets are flanked with flickering gas lights as a group of people stand and chat in the wake of the colossal Generator. Children play, fights break out and complaints are yelled, all packaged together into the living, beating society of New London. Every aspect of the game reminds you of the plummeting temperatures threatening your city. The panorama of snow-covered rooftops amongst the plumes of smoke, the massive glacial crater which surrounds your colony and endless frozen desert which stretches in every direction, throwing icy gales at your bastion of humanity. Even the UI has had effort and detail put into extending this new world: from the ice framing the game’s view refracting light and creeping in as the temperature drops, to the crackle of frost and the beating heart of your city as you review laws and research. 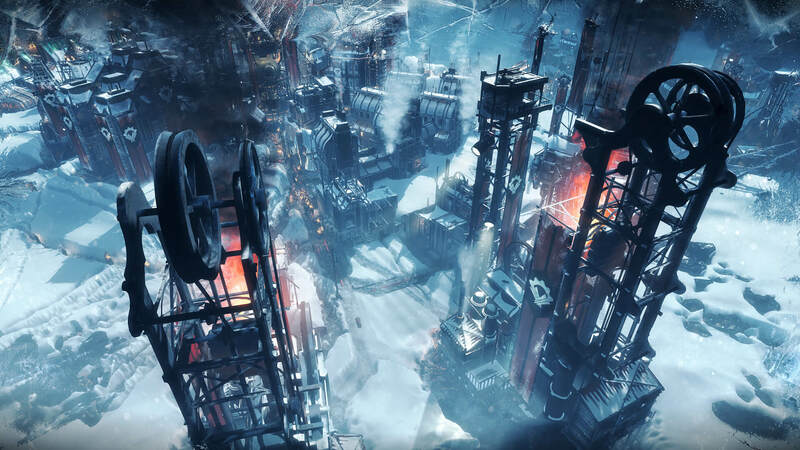 Attention has been put into every visual detail of Frostpunk, and it pays off fantastically. I only wish you could zoom in more than the game allows, to better see the intricate details of the huddle of people eating lunch in the snow and rummaging through piles of coal. 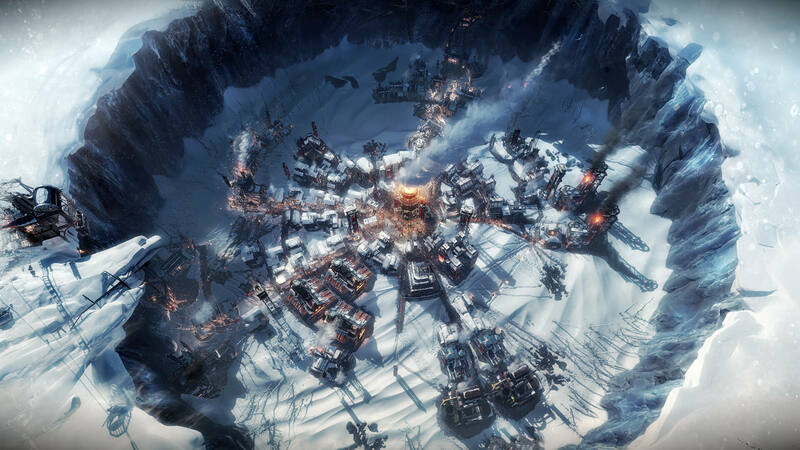 Frostpunk is a tense and exciting city-builder; it paints a beautifully bleak dystopia of hypothermia, starvation and hope, and puts you in charge of ensuring the last bastion of humanity survives. The moral choice system – whilst providing some emotional context to New London’s fate – falls flat after a few hours of gameplay. Eventually, each of your choices are made by a mere glance towards the Hope and Discontent bars and selecting whatever prevents one of the other from ending the game. The city-building, resource management and survival aspects are wonderful, and the visual panoramas of your growing city are beautiful enough alone to warrant playing the game. Giant clunking automatons carefully threading their way down streets, towering over the surge of humanity toiling to ensure the source of their heat and survival never runs out of coal. As far as the “end game” goes, it felt particularly rushed in the grander scheme of the game’s design: as if the developers had built all the mechanics of the game, then as deadlines drew near realised they should give the player an end to work towards. Whether or not the chosen way to end was due to the alternative scenarios is hard to tell, but I felt much more could’ve been done with the direction they were taking it. Despite the personal feelings above, the game is an absolutely fantastic entry into 2018’s line up, and if you are into strategy, simulation or city-building, Frostpunk’s frozen Victorian world is definitely worth your time and money. Frostpunk is available to purchase on Steam and GOG. An aspiring game developer who spends more on his Steam library than monthly food budget, and attempts to put strings of words together into articles and stories.